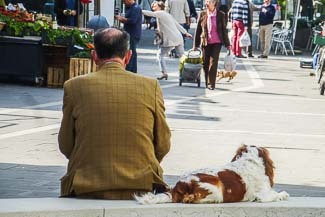 ABOVE: A man and his dog take a break while shoppers go out and about on a Saturday morning. For much of the year, the Lido is a dormitory suburb of Venice. Shops and services are geared mostly to locals, and you'll find a much wider variety of shops in Venice than on the Lido. Still, if you're in a shopping mood, you'll find a reasonable assortment of boutiques (along with a handful of souvenir shops) on the island's main business street, the Gran Viale Santa Maria Elisabetta. Another shopping street is the Via Lepanto, which starts off as a pedestrian zone to the right of the Gran Viale as you walk inland from the Lido S.M.E. waterbus station. On Saturdays, vendors set up stalls along the street and under a shelter on the Via Vettor Pisani, across a canal from the Via Lepanto. During the warmer months, you can buy swimwear and other beach-related items in a shop at the Lido's public bathhouse. Do you need to load up on picnic supplies, stock the kitchen of a self-catering apartment, or buy pesto and pasta for the folks back home? Try the Conad City supermarket (see our Lido Restaurants and Food page) and Rizzo, a deli, bakery, and confectioner that offers a wide assortment of food gifts. Rizzo also has a café next to its shop on the Gran Viale Santa Maria Elisabetta, not far from the waterbus station.